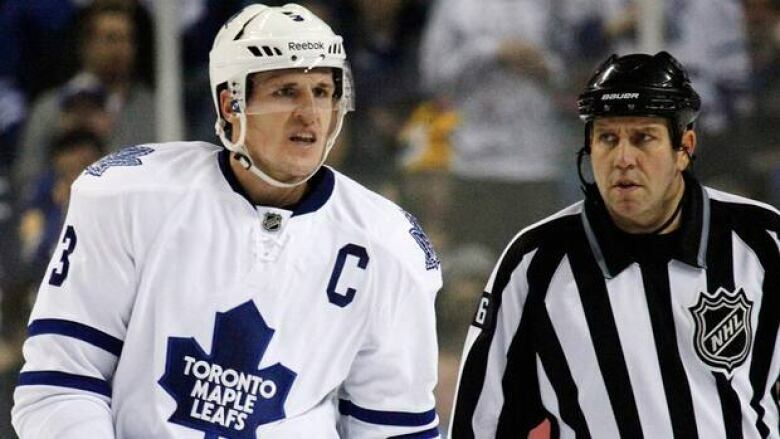 Toronto Maple Leafs defenceman Dion Phaneuf is the most overrated player in the NHL, according to a poll conducted by Sports Illustrated released Wednesday, and that has the team's GM Brian Burke fuming. "Whoever fills out the ballot has a room-temperature IQ," he told a Toronto radio station on Wednesday. "I will speak slowly when I see [them] because you're obviously a cretin." Brian Burke directed his ongoing frustration with sports media in a different direction Wednesday. After taking umbrage earlier in the season with criticisms of Maple Leafs head coach Ron Wilson from the Toronto media and a local reporter contacting James Reimer's family to understand the severity of the goalie's then-reported concussion, the longtime National Hockey League general manager attacked U.S.-based sports publication SI.com for its poll on the league's most overrated player while speaking on The Fan 590 radio. In a poll of 161 players, Leafs defenceman Dion Phaneuf topped the list, further upsetting Burke. "Yes, players dumb enough to participate in polls designed to crap on fellow NHLPA members are not very bright," Burke told the Toronto Star newspaper earlier on Wednesday. "They can all go defecate in their chapeaus. I am thrilled to have both players on my team." The other player Burke was referring to is blue-liner Mike Komisarek, often the target of boos for his disappointing play since his arrival in Toronto via free agency on July 1, 2009, but a player who has improved his play this season. He ranked 10th on SI's most overrated list. Washington Capitals star Alex Ovechkin was second, while Montreal Canadiens forward Scott Gomez was third. "Whoever fills out the ballot has a room-temperature IQ," Burke told Fan listeners. "What player votes in a poll like this? I will speak slowly when I see [them] because you're obviously a cretin." The GM also invited any player who dissed Phaneuf in the poll to meet him face-to-face in Ottawa on Jan. 28 ahead of the all-star game the following day. "I've told [people] today, fly to Ottawa and discuss this with him, because he's a starter in the all-star game," said Burke. On Jan. 31, 2010, Burke acquired Phaneuf from Calgary in a seven-player trade. The defenceman finished third in Calder voting for NHL rookie of the year honours in 2006, but some have argued Phaneuf's play tailed off after that and he's been coasting on reputation. The 26-year-old struggled in his first full season in Toronto with eight goals and 30 points in 66 games a year ago, but has bounced back with seven goals and 28 points in his first 42 contests this campaign to rank third in Leafs' scoring. Earlier this season, Wilson called Phaneuf the best active defenceman in the NHL. The Leafs certainly are a different team with Phaneuf in the lineup, having fashioned a 67-51-16 record. "A very simple answer for an anonymous poll is that people tend to vote for players they don't like to play against," Leafs assistant GM Dave Poulin told the Star. Vancouver Canucks goalie Roberto Luongo was fourth in the SI.com poll, followed by Dany Heatley of the Minnesota Wild in fifth and Ilya Kovalchuk of the New Jersey Devils in sixth. Tampa Bay Lightning captain Vincent Lecavalier ranked seventh on the list, while Calgary Flames defenceman Jay Bouwmeester was eighth and Vancouver's Ryan Kesler ninth.